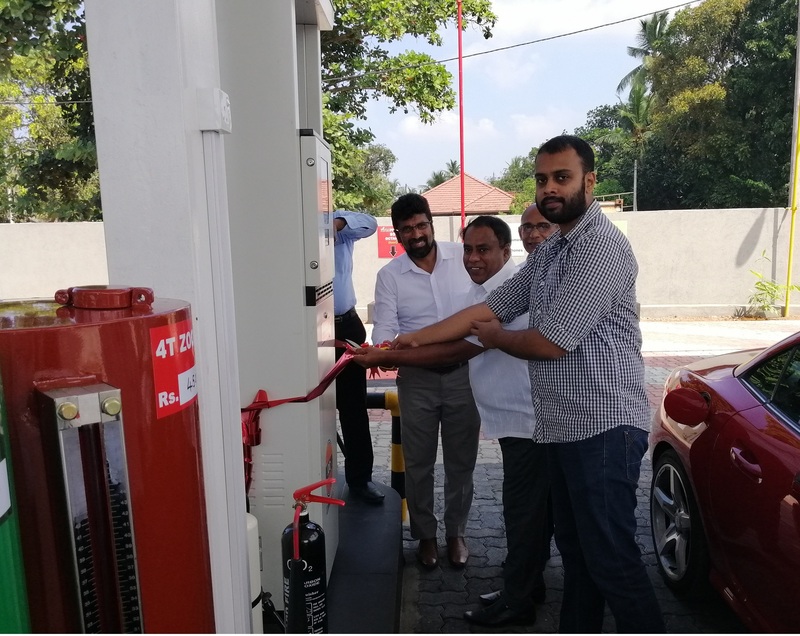 Setting another benchmark in the fuel retailing industry in Sri Lanka, LAUGFS’s Southern Petroleum launched the country’s second solar-powered fuel filling station at Waskaduwa, Kalutara with a 46.1 KW solar-panelled roof. The iconic solar-powered fuel station is expected to generate and add over 5,520 kWh per month to the National Grid as an annual average. This was launched as part of the company’s plans to meet the electricity requirements of its network of fuel stations with renewable energy sources. “This innovative concept is a one of a kind in the local petroleum retailing industry and will enable us to not only utilise cleaner energy for daily operations of our fuel stations, but will also reduce our overall dependency on non-renewable energy sources for electricity,” commented Southern Petroleum Director/Chief Executive Officer, Mahesh A. Weerasena at the launch of the new fuel station in Waskaduwa. “Further in line with this, we aim to install solar rooftops across Southern Petroleum’s island-wide fuel filling station network and thereby add around 1 MW of electricity to the National Grid. Our next solar-powered filling station is coming up in the Southern region in Matara,” he remarked, further elaborating on the company’s future plans. 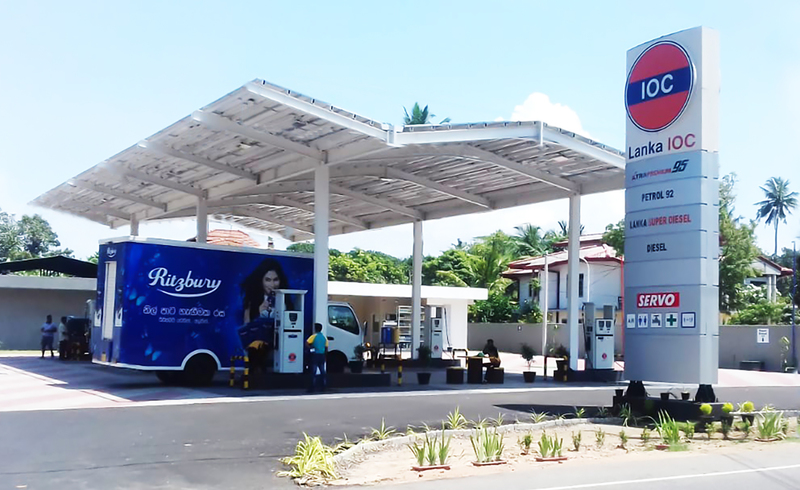 LAUGFS’s Southern Petroleum launched the first of its fuel stations with solar panelled roofing at Pepiliyana early this year, which was awarded with the prestigious Silver Award Certificate from the Green Building Council of Sri Lanka. “I would also like to thank the LIOC Chairman, Managing Director, Senior Vice President – Sales and HR and other key officials for their continued support, enabling us to introduce this innovative concept of solar powered fuel stations,” commented Weerasena. The new Waskaduwa fuel station of Southern Petroleum offers Xtra Premium 95, Euro 4 Standard Petrol 92 Octane, Euro3, Lanka Super Diesel, Lanka Auto Diesel and Extra Mile. It also offers high quality branded lubricant and car care products for the convenience of motorists, together with LAUGFS domestic and industrial LPG cylinders. LAUGFS Petroleum is a fully owned subsidiary of LAUGFS Holdings, and operates a broad network of fuel filling stations across the country. Today the company serves around 25,000 customers island-wide through its expansive filing station network. In its continuous efforts to pioneer and set new industry benchmarks, the company was also the first to introduce the concept of NFC technology to the local petroleum retailing industry. LAUGFS is one of the largest diversified business conglomerates and a trusted name in Sri Lanka. Founded in 1995, LAUGFS today has expanded across 20 industries in Sri Lanka and overseas, establishing a strong presence as a leader and pioneer in the power and energy, consumer retail, industrial/manufacturing, services, leisure and logistics sectors. With over 4,000 employees and an annual turnover exceeding Rs. 37 billion, LAUGFS continues to expand and empower millions as a trusted Sri Lankan brand.